Home :: Jamaica Tours :: Montego Bay Tours :: Authentic Jamaican Jerk Experience Dinner. Are you ready for a real Jamaican dining experiences, our experienced driver will pick you up in our fully air-conditioned vehicle for a trip to the most fun, vibrant and dynamic restaurant experience. Jerky’s Bar & Grill is a unique addition to the Montego Bay landscape with an open, serene environment that has a great “look out” view that is very relaxing and enthusing. 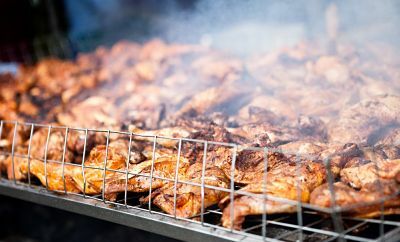 Menu: Jerk Chicken, Jerk Pork, Curried Goat, Fish (Steamed, Jerk or Fried), Wings (BBQ, Hot & Spicy or Mixed), Conch (steamed, grilled or curried), Ribs (pork). SIDES: Festival, Fries, Breadfruit, Bread, Bammies, Rice and Peas, White Rice. Ask a question about the Authentic Jamaican Jerk Experience Dinner.